Juneau has quite an array of things to do. 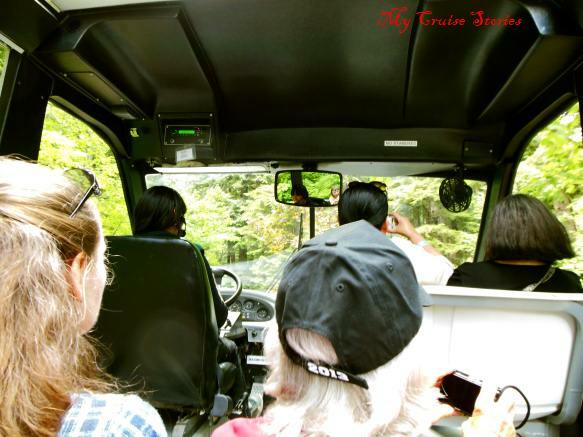 With Mendenhall Glacier as the tourist’s top choice, and Mount Roberts tram conveniently located at the cruise ship dock in the center of the tourist shopping area, multitudes of people visit those two places. Sometimes you can have a pleasant day at a more off the beaten path spot too. 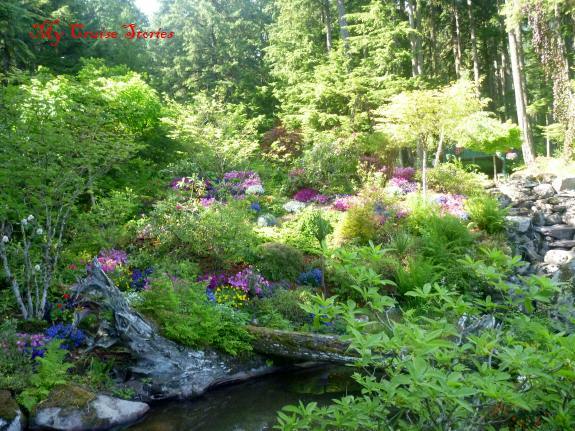 We found one such spot with a visit to Glacier Gardens on a shore excursion. 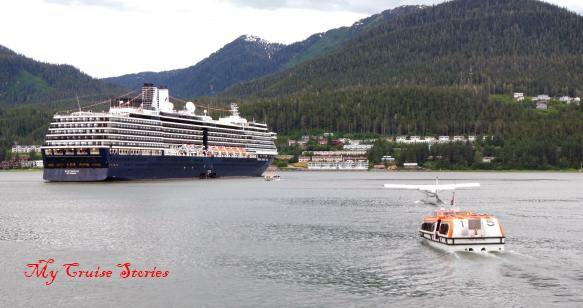 We came into Juneau on the Holland America Westerdam. 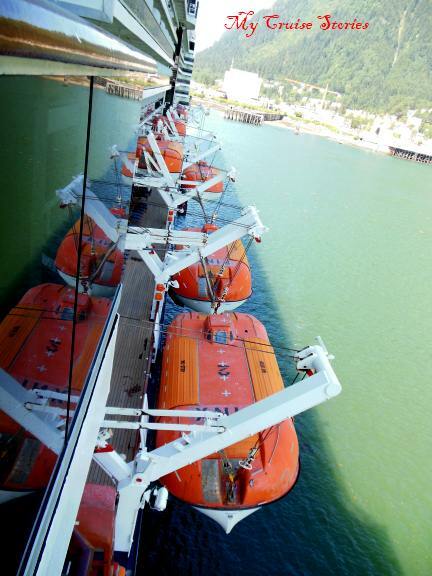 It was originally scheduled to dock right in town as Holland America ships normally do. After the ship set sail we found out we would tender in Juneau as well as in Sitka, which is always a tender port. We really don’t know why we tendered in Juneau, other than perhaps the extreme minus tide that day. 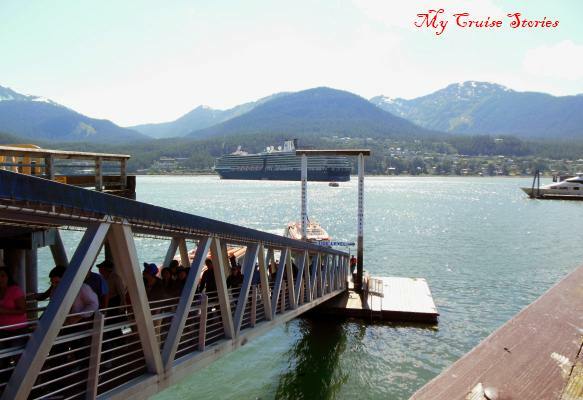 We speculated that the shallower water may have left room for just one Holland America ship at the downtown dock right by the entrance to the Mount Roberts Tram where normally two ships tie up. For whatever reason the Zuiderdam got to dock while the Westerdam had to anchor. I found out just after the cruise that I actually knew someone on the Zuiderdam that cruise. Had I ran into them in town they would have had a chance to gloat about getting the dock while we anchored. Maybe their captain won a coin toss or beat our captain at rock-paper-scissors or something. Possibly they got the dock because they arrived first. At any rate tendering unexpectedly does give the crew some extra practice with the life boats. Considering how much more smoothly the tendering process went in Sitka where they expected it than in Juneau where they did not perhaps random tendering does have an up side in that the crew gets some last minute life boat time making them just a little bit more ready should a real emergency ever arise. It took awhile for things to get moving. We met at the shore excursion lounge, while those without excursions went to a different area to get tender tickets. The time for our departure came and went before earlier excursions began to get called. Excursions involving helicopters and float planes seemed to get priority as some had later scheduled departures then we did, yet got called first. Actually everyone else must have had priority as the room emptied considerably and when they finally called our tour about an hour late pretty much everyone still remaining in the room got up to go. We all fit on one tender (lifeboat) but it took two busses to hold everyone on our excursion. We had 7 people in our family group so we passed by the first already partly loaded bus and headed for the less-crowded second bus to insure we all got on the same one and could sit near one another. On the way out of town our driver Russ-who-drives-a-bus kept up a very entertaining almost steady narrative about the area with a few jokes thrown in. He also talked about the wildlife of the area, such as the house cat sitting by the roadside and the bald eagle flying past. Bears, he said, lived in the area too. He had an easy way to tell one bear from another. If a bear chases you and you climb up a tree and it climbs up after you, then it is a black bear (the color of which may be black or brown.) He did not mention that black bears also come in white. Probably because the kermode bears – white black bears sometimes called spirit bears – live only in a very small area of British Columbia, Canada and most people have never heard of them. Following a short drive through Juneau rush hour traffic, which Russ said would delay us by about 3 minutes, we arrived at Glacier Gardens. 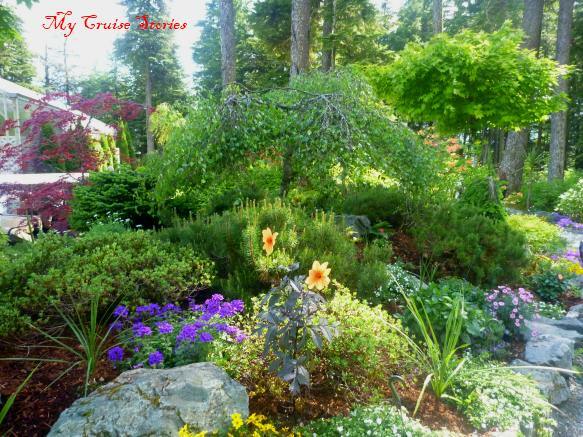 Glacier Gardens started as a landscaping business. The story the guide told said that the owner bought the land at a low price following a massive mudslide which wiped out everything formerly on that site. After discovering that the river running down Thunder Mountain through his property ran far too fast piling up debris waiting to cause another landslide along its path, he built a series of waterfalls and ponds along the new route he created to take a river from plunging straight down the mountain at top speed leaving a wake of destruction in its path to one that meandered slowly and harmlessly down the mountain. Eventually he had to rent a large excavator and promptly crashed it into a tree. In his frustration he used it to pull a tree out of the ground and flip it over intending to smash it to bits. Driving it into the soft mud left it standing root side up instead. 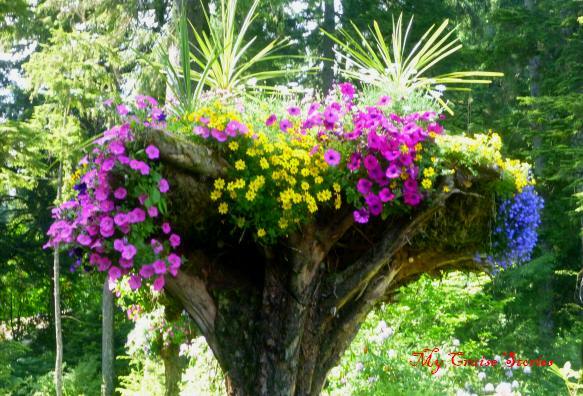 This inspired the upside-down flower tower, many of which now stand tall and proud as sentinels to the gardens. Our tour included a brief stop at the gift shop followed by sighting of an eagle’s nest high in a tree. Then they loaded everyone onto a series of motorized trams for a trip over 500 feet up the side of Thunder Mountain, named not for thunder, but for the thundering sound it makes when avalanches break away. 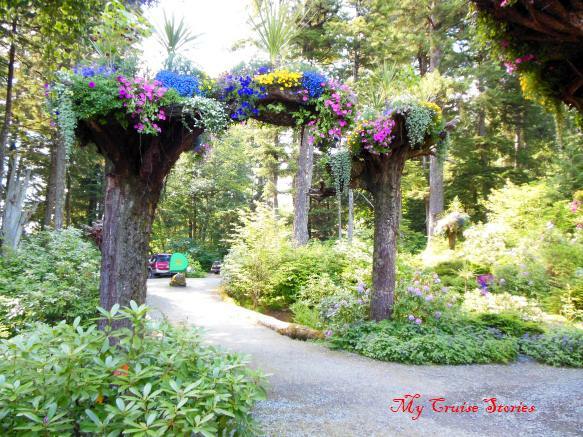 We passed more flower towers on the way up before leaving the landscaped area and entering natural forest. Fallen logs comprised a lot of the material used constructing the road. Over the logs they use a sturdy black paper covered in gravel that helps prevent erosion in the logs so the road lasts longer. 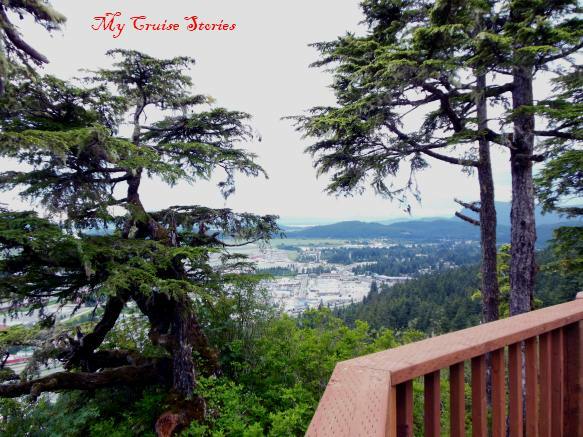 The top of the mountain brings territorial views of the surrounding area, including the cruise ships in the distance. The lookout also offered views of the airport where we watched some helicopters and airplanes come and go. Russ told us Juneau could claim to have an international airport as they had a weekly flight to the far distant country of Canada. Upon take-off one day the tower warned a pilot about four eagles flying toward the plane. One had a salmon in its talons and as the others squabbled trying to take it, none of the birds paid any attention to the fact that they were heading directly for an airplane so the pilot had to take evasive action. He heard a thud against the plane, but upon landing and inspection no trace of eagle was found – just that of salmon. So Juneau is now the only airport where pilots may need to watch out for flying fish. We had some time on top the mountain to take in the various views and take photos and then boarded the trams to make our way back down. 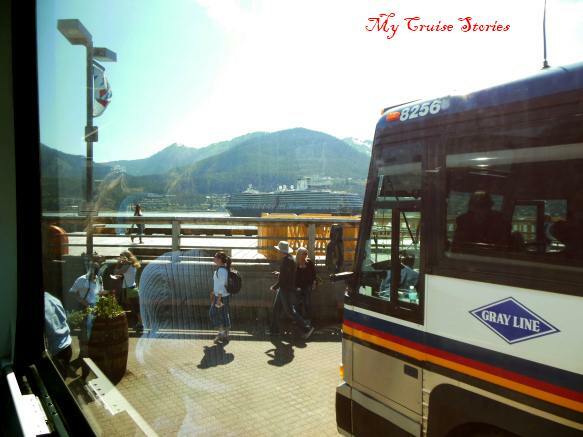 Our tram guide mentioned our luck in the beautiful sunny day we enjoyed as Juneau has 300 days of precipitation annually. After spending some time in the gift shop (which is in a greenhouse), we boarded the bus and headed for Mendenhall Glacier. We managed to leave with our wallets intact and no packages to carry to our next destination. 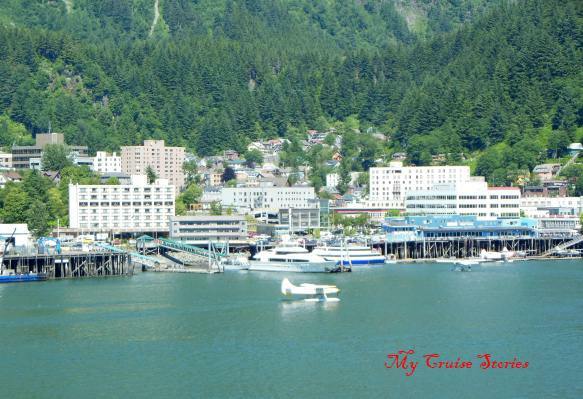 This entry was posted in Alaska, Holland America, Port Cities, Ports of Call, Shore Excursions, Westerdam and tagged Alaska, cruise, family, fun, Glacier Gardens, Juneau, photos, shore excursion, travel, vacation. Bookmark the permalink. It was a great cruise. In Glacier Bay the ship parked right in front of a glacier for about an hour. After the first half hour it turned around so all the people with balconies on the other side could see. The glacier calved right in front of us several times, but uncooperatively never when I had the video camera out. Some day! Some day, soon… I hope. Did you get more time in Juneau this time? 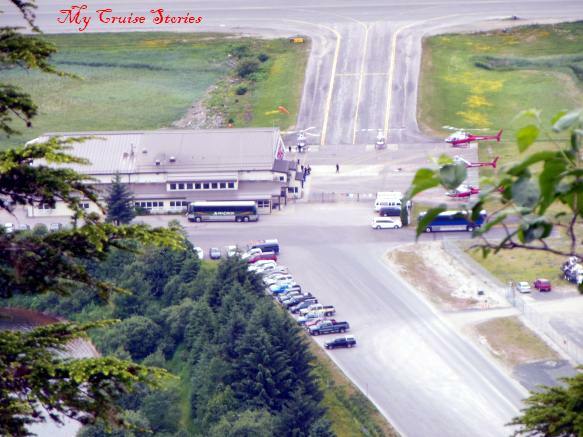 We had fun there last time but it was our shortest stop so we were a bit rushed at the top of the Mount Roberts Tram. Juneau has some great views. We did have more time, but that hour delay for the tender took up a good chunk of it and the shore excursion we took went two places. We did have longer at the top of the tram than when you went though. 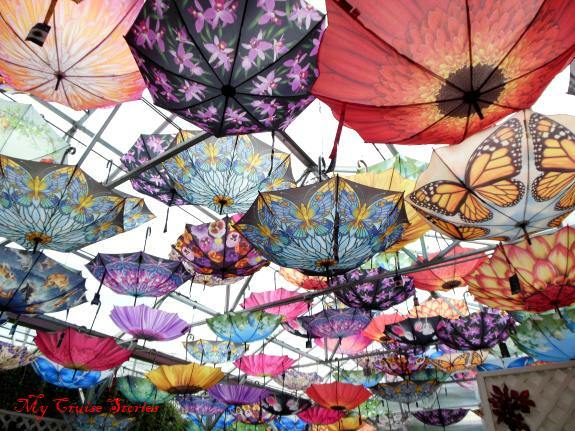 You have goodpictures and it is a beautiful spot! I’m glad we went there.